Dan Short was the Master of Ceremonies for the OVB bend area office ground breaking ceremony. Dan Short, Pastor Mathew Phoenix, Valorie Storms, Jeff Smith, Mario Liberatore, Anna Barnitz, and Steve Turner participated in the ground breaking ceremony along with Mayor Donna Dennis, OVB President and CEO Tom Wiseman, Director of the Mason Co. Development Authority John Musgrave, and West Virginia Bankers Association President and CEO Salley Cline. 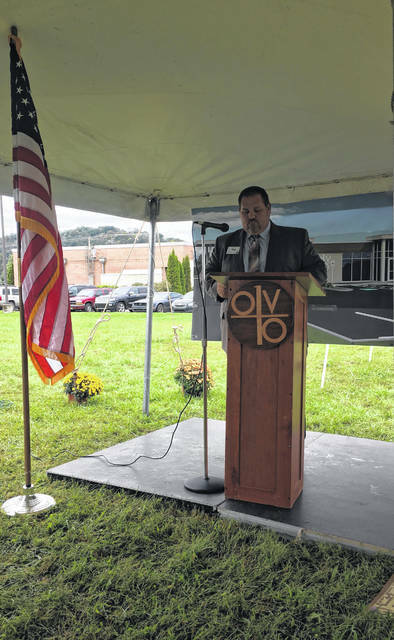 MASON — Ohio Valley Bank held its ground breaking ceremony Tuesday to honor the start of construction on the new Bend Area Office in Mason, West Virginia. Dan Short, OVB officer and region manager, was the Master of Ceremonies, Pastor Mathew Phoenix of Wesleyan Bible Holiness Church gave the invocation, and Valorie Storms, OVB assistant branch operations manager, led the Pledge of Allegiance. Also, the Wahama High School Choir performed The Star Spangled Banner at the start of the ceremony as well as various selections prior. “It is my privilege to be here as an employee of the Ohio Valley Bank as we embark on this journey. The current office has suited our customers for 20 years, but we’ve not always had the convenience our customers desire, with the new facility we are introducing this morning, we hope to build upon the success of the past and be able to serve our customers with the same passion they’ve grown to expect,” said Short. The OVB Bend Area Office will be 2,100 square feet, as well as have a drive through night deposit, a drive through teller window, and a drive through ATM. The office will also have five staff members working to give their customers a pleasant banking experience including Short, Storms, Jody Lavender, Ashley Fields, and Deborah Sparkman. Speakers for the ceremony included Jeff Smith, chairman of the board, OVB; Mario Liberatore, president, OVB West Virginia; Anna Barnitz, Treasure and CFO of Bob’s Market and Greenhouses, Inc. and member of the Ohio Valley Bank Board of Directors; Steve Turner, general manager for Major Projects, MPA services. Barnitz commented on how OVB staff are apt to always put their community first. “Ohio Valley Bank management and employees, they don’t just invest in the community with monetary contributions, they invest in our community with their time. I’m proud to say that the management and employees of the bank have donated over 11,000 hours of community service to our communities…Ohio Valley Bank is a bank that truly understands what it means to put community first,” said Barnitz. Ohio Valley Bank was established in 1872 and operates 19 locations throughout western West Virginia and southern Ohio. Ohio Valley Bank opened its first office in West Virginia in 1994 in Point Pleasant. https://www.mydailytribune.com/wp-content/uploads/sites/42/2018/09/web1_0926-2-1-1.jpgDan Short was the Master of Ceremonies for the OVB bend area office ground breaking ceremony. 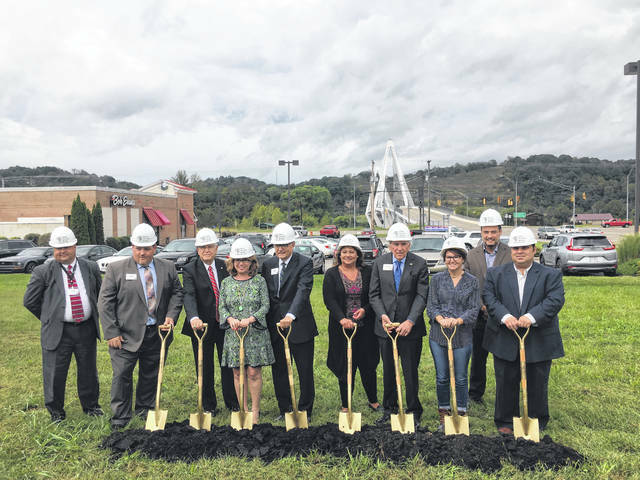 https://www.mydailytribune.com/wp-content/uploads/sites/42/2018/09/web1_OVB-1.jpgDan Short, Pastor Mathew Phoenix, Valorie Storms, Jeff Smith, Mario Liberatore, Anna Barnitz, and Steve Turner participated in the ground breaking ceremony along with Mayor Donna Dennis, OVB President and CEO Tom Wiseman, Director of the Mason Co. Development Authority John Musgrave, and West Virginia Bankers Association President and CEO Salley Cline.